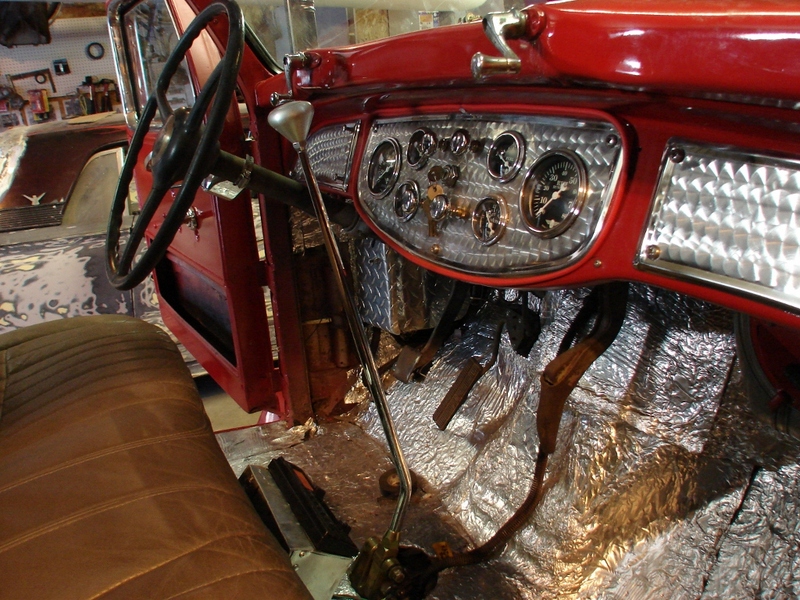 Diamond T interior wrapping up! Remember the snakes nest of wires laying on the seat yesterday? Well, that’s ALL gone now, tidied up, wrapped up, and up behind the dash. Out of sight, out of mind, right? Lets hope so, anyway. 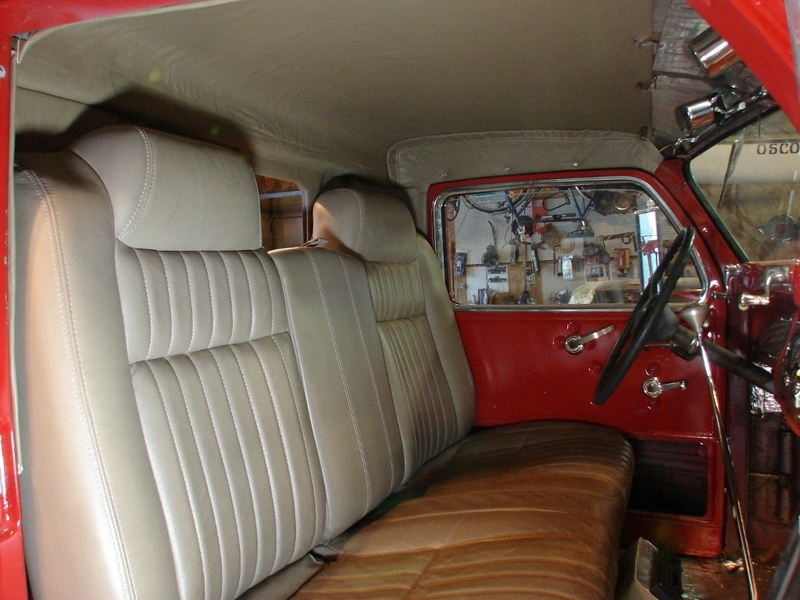 The stereo is installed, just out of the frame in this picture, mounted to the seat base, facing up. 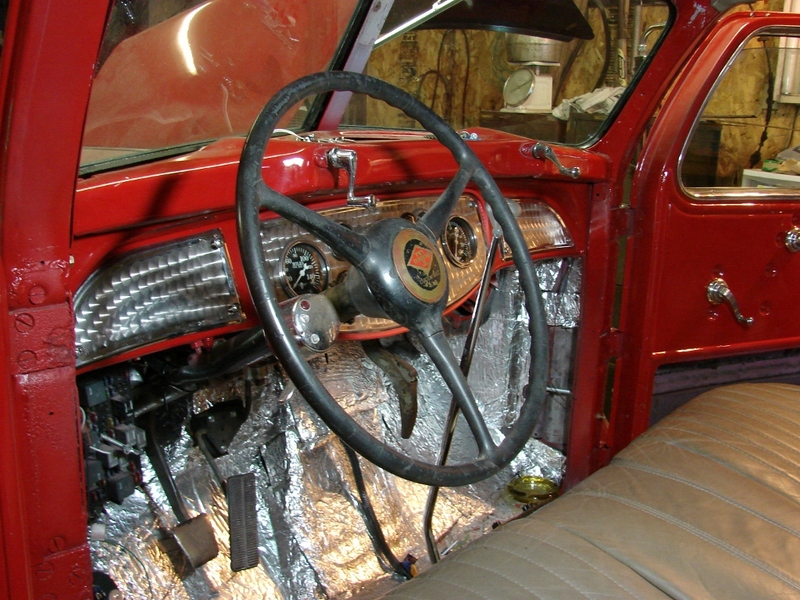 It’s easily visible from the driver’s seat, mounted in a little aluminum box I made, that I think will have to be re-done in sheet metal, as the aluminum is a little to flimsy I think. It’ll make a good pattern though. 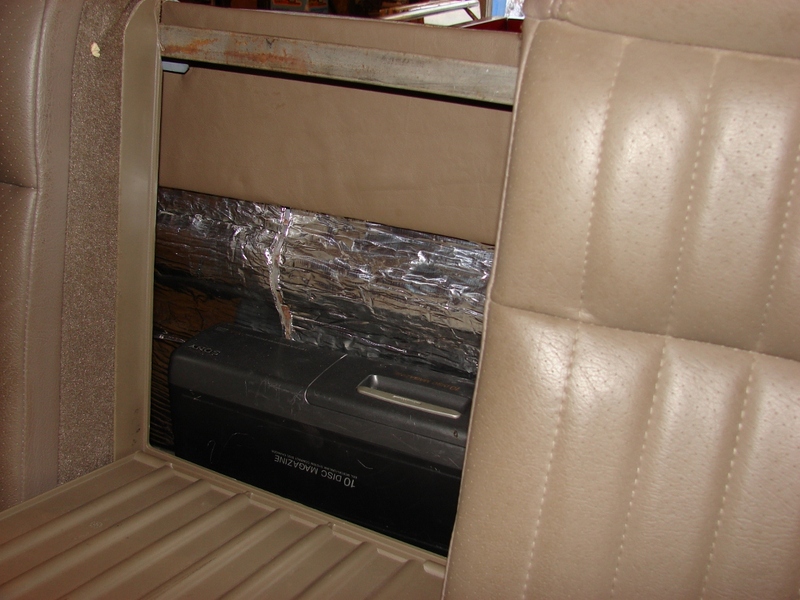 The CD changer (yes, we still have CD’s) is behind the center armrest, again, out of sight. Since it holds 10 disks, we can load it up and forget it, at least for a while. Also planned is a satellite radio converter, which can simply hang from the dash, or be tucked up in the overhead console. I want one that’ll play through an FM station, so we can pre-set it. We have Sirius radio in Kim’s Fusion, it’s very nice. I had the Sony radio, and CD changer, so I figured why buy another radio. I need to get some speakers yet. 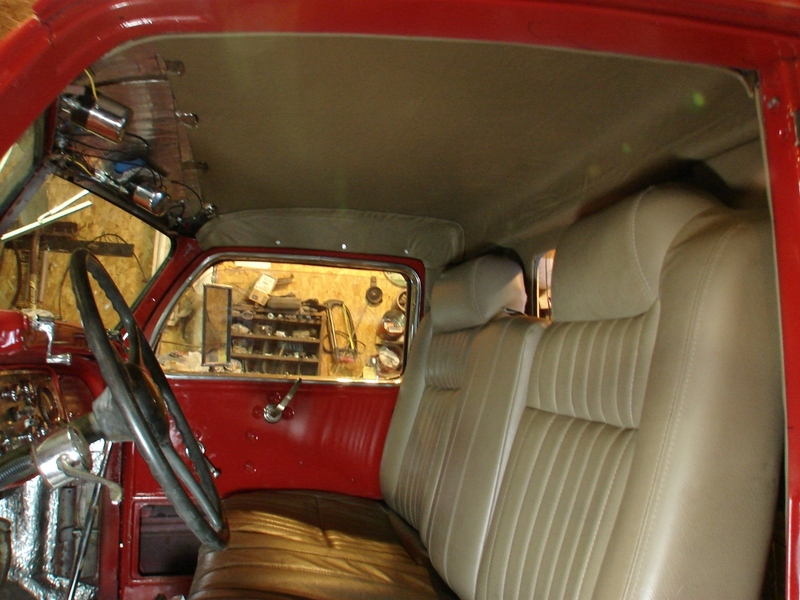 I think a pair of small ones will fit in the kick panels, some bigger ones in the doors, in the panel that’ll cover the empty hole seen in the passenger door here, and maybe a pair of small ones up in the cab corners. We’ll see. I noticed just yesterday that I hadn’t painted the windshield divider bar when I painted the truck. Duh. Well, I have to paint the windshield header panel, and the trim pieces for the door jambs, so I’ll do them all together when it warms up. Plenty of things to do untill then! 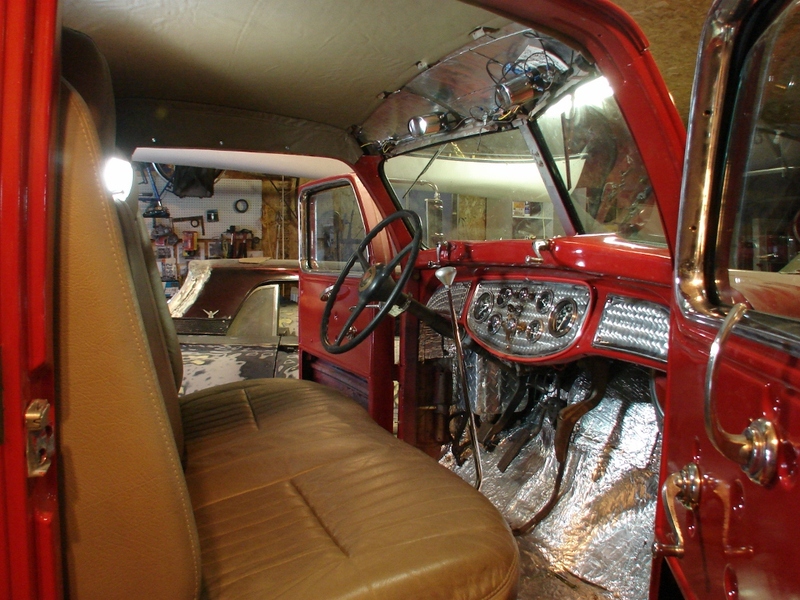 For now, it’s great to have the wiring finished up, the upholstery (mostly) done, and see light at the end of the long, long tunnel. See, I should go to Florida more often! Look at all you accomplished without me distracting you! 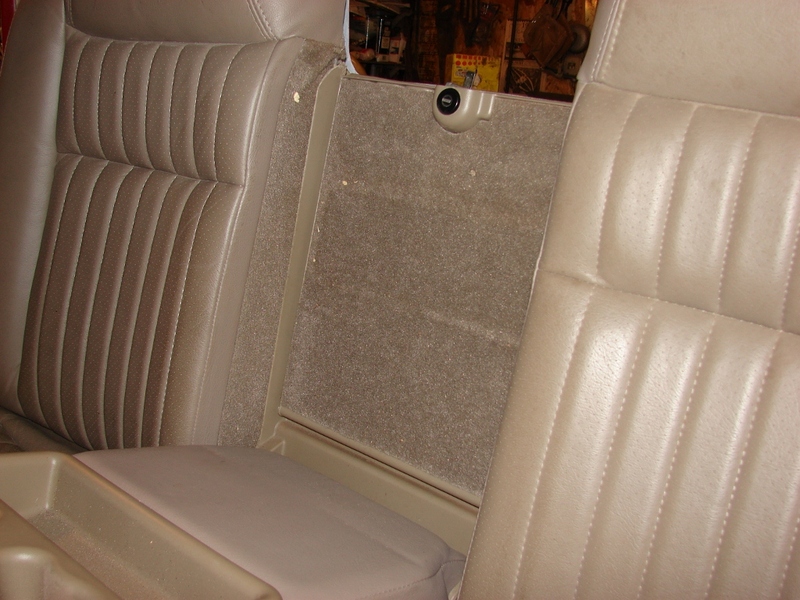 More Diamond T upholstery work.